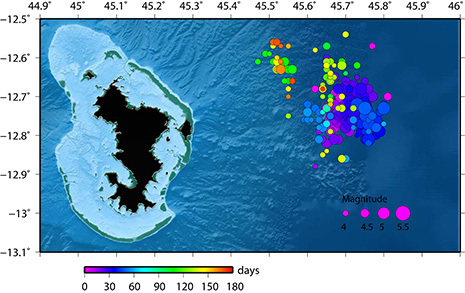 It was just one week ago that France’s Bureau de Recherches Géologiques et Minières (BRGM), the geological agency for Mayotte, issued an updated report on the science behind a seismic swarm that’s been affecting the Indian Ocean island for more than six months. And then, on Tuesday morning, came a jolting reminder that it’s not over yet, with a 5.1-magnitude earthquake at 8:11 a.m. local time. It was the largest since June 27, and the latest since the swarm began on May 10, creating hundreds of small and frequent quakes – and a few larger ones. A magnitude-5.8 earthquake, the largest ever recorded in the Comoros basin, struck just off the coast on May 15. Mayotte is part of the Comoros group of islands but remains a French territory, located at the northern edge of the Mozambique Channel between the southern African mainland and Madagascar. Since then, there have been peaks and valleys in the activity, which spiked in May and June but then appeared to level off in both frequency and intensity. BRGM stopped issuing daily reports in June and shifted away from twice-weekly reports in September because the quakes were no longer a crisis but a routine occurrence. November has seen levels higher than most of late September and October. Scientists continued to study the phenomenon, which has caused some damage and a few injuries but as yet no severe consequences. Magnitudes have been consistently lower, at least until this latest jolt. “The appearance of the seismic swarm in May 2018 surprised the scientific community,” the BRGM said. The causes are still under investigation, but new data gathered by a team at the geology laboratory of the Ecole normale supérieure in Paris has shown that the current phase of the swarm is explained by a mysterious volcanic component. The latest BRGM seismic swarm report is available here.